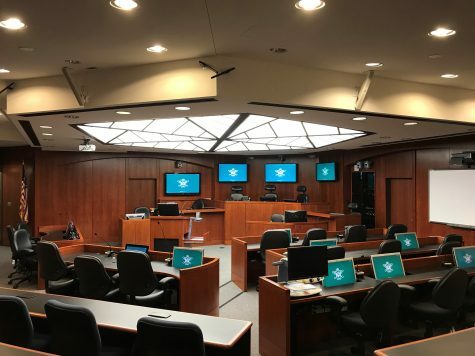 From the latest hardware to software, the McGlothlin Courtroom serves as a testing bed for the latest advances in courtroom and legal technology. The Courtroom permits remote appearances for judges, counsel, witnesses, interpreters, court reporters, and even jurors. CLCT continually experiments with the latest technology to determine its potential utility and legal effects. For example, CLCT organized the first known court use of virtual reality evidence, holographic evidence, and 3D evidence in the McGlothlin Courtroom. In 2017, with FTR, CLCT produced the first virtual reality court record. CLCT constantly upgrades its equipment, most of which is loaned to it by the CLCT Participating Companies. The McGlothlin Courtroom is not simply a courtroom; it is also a laboratory and a classroom. One of the most important uses of the Courtroom is as a training ground for tomorrow’s lawyers. William & Mary’s Technology-Augmented Trial Advocacy course, one of the most sophisticated in the nation, is taught in the McGlothlin Courtroom. CLCT regularly welcomes groups of all types for courtroom demonstrations for groups from all over the world. This content has been updated on April 25, 2018 at 4:47 pm.